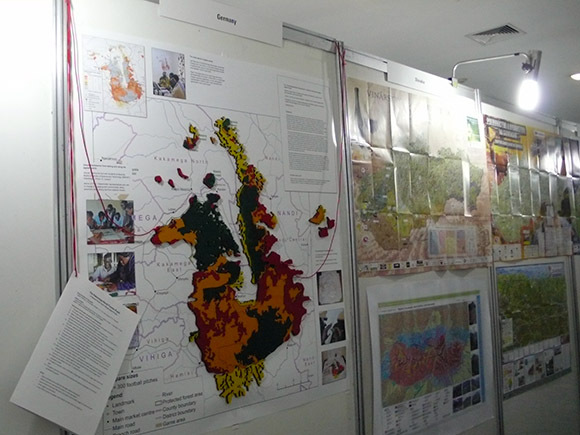 At the 27th International Cartography Conference in Rio de Janeiro, Brazil, the cartographic product “The Kakamega-Nandi Forests Puzzli – A Natural Forest Cover Change Jigsaw Puzzle” won the second jury prize in the category educational cartographic products. 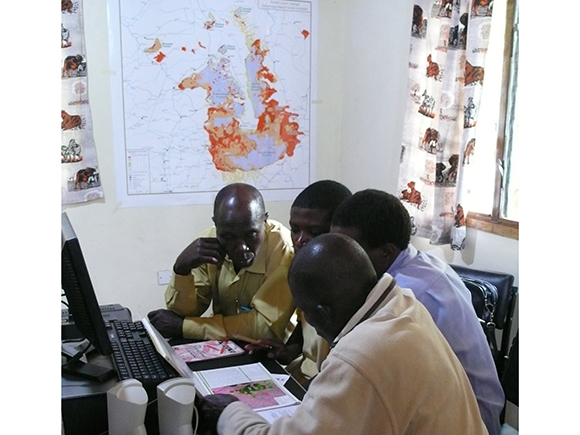 Publisher’s Description: By means of a participatory approach iterating through three steps (consultation workshop, evaluation workshop, end-user testing) and involving more than 30 representatives of local stakeholder institutions as well as 60 potential end-users, a final prototype for a jigsaw puzzle was developed in western Kenya. 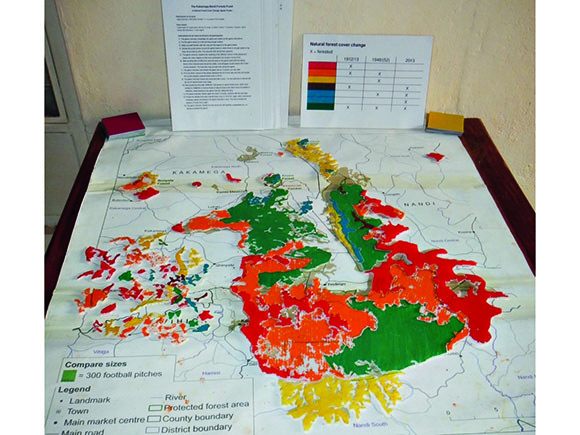 The education material covers the Kakamega-Nandi forests area which has experienced a loss of about 60% in natural forest cover over the last 100 years due to human interferences. 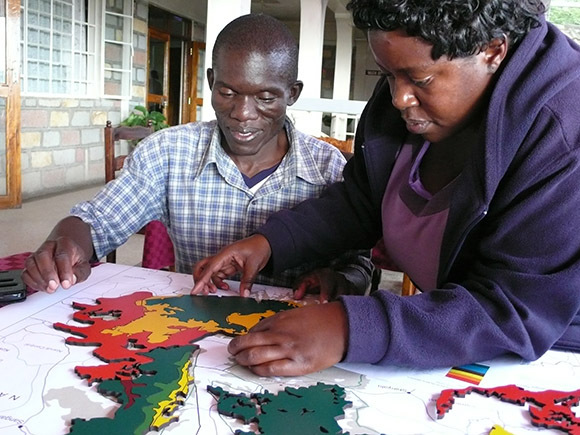 The environmental education tool includes a game board (80 cm by 72 cm) with a base map in 1:75,000 scale. 91 stable and big-enough jigsaw puzzle pieces resulted through rigorous generalization of initially 2012 objects which had been derived by geometrically intersecting the forest extents of three time steps. The pieces are coloured by six distinctive shades based on a matrix legend. 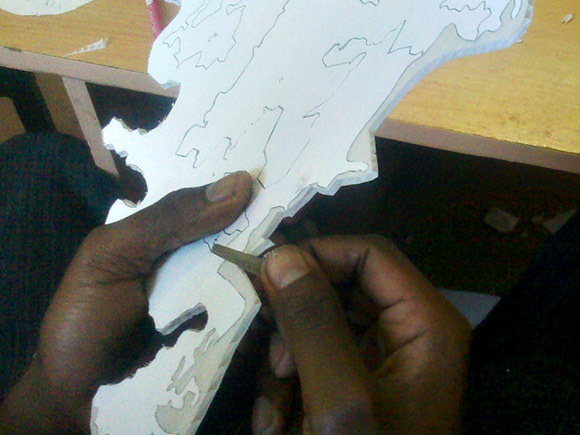 The game comes with a manual which contains beside the instruction also solution maps for the changes which have taken place and the story of forest cover change providing reasons for loss and gain. The story will be narrated step-by-step by a conversant instructor as soon as the users have completed a time step. An additional matrix legend is required to remind the users on the meaning of the colours. 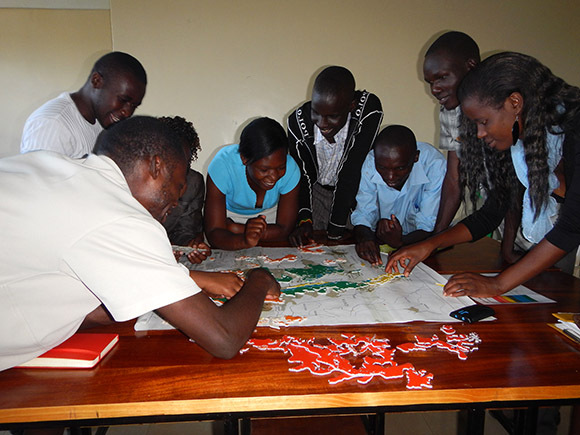 The playful environmental education tool proved to be helpful in engaging the local people as well as the decision makers and thus in increasing the knowledge on the forests in the area as a prerequisite to informed decisions in nature conservation.